Kerala Prawn Curry has got to be my most often made curry at home.If there is prawn then more often than not we will end up making this. It’s simply the most fuss free, easy to make preparation of prawn ever. My friends in college were the ones who literally threw me blind into the world of non vegetarian food! Every time we ate out, they would order these yummy looking exotic dishes and I had to eat my cauliflower in silence!!! Back then I never envisioned myself eating prawn ,leave alone cook it. But I love prawns now and I want to thank these 6 girls for it. I still remember the first time I ate tiger prawns back in 2003, ,it’s etched in my brain like it was yesterday. We were sitting on our hostel room floor surrounded by 3 ugly metal bunk beds ,with barely enough space to accommodate 6 butts, gorging on amazing Bengali treats straight from my friends mom’s kitchen in Calcutta!We got one gigantic tiger prawn each and i was hooked. 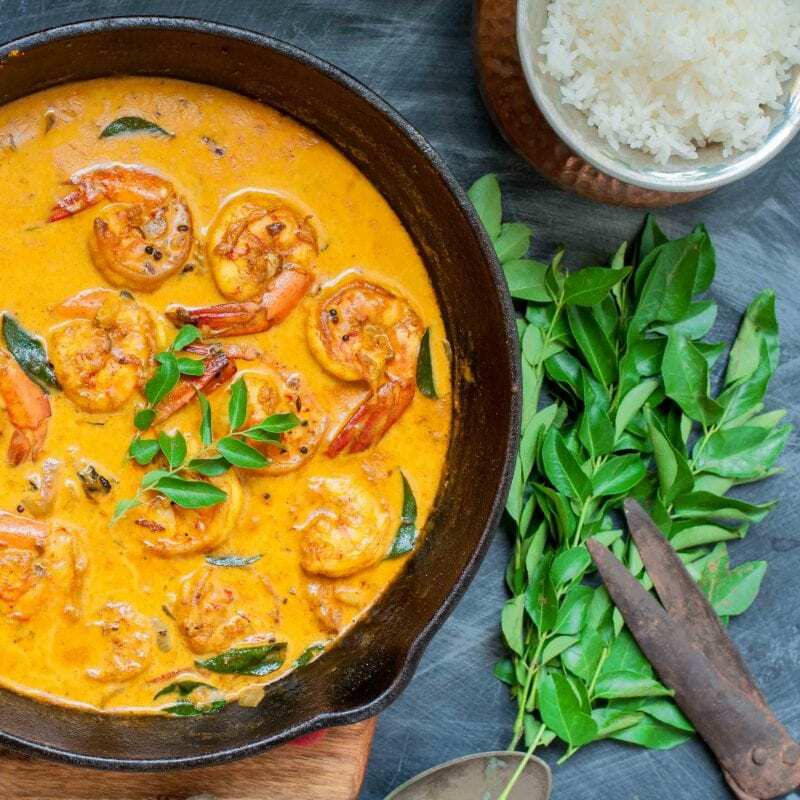 Kerala Prawn Curry is made with Coconut Milk and Kokum, also known as kadampuli in Malayam and its scientific name is Garcia Cambojia. If you cant find Kokum at your local store, Tamarind or plain old lemon juice also work well with this dish.You can also replace the prawn with any kind of white fish pieces and call it fish curry! It’s best to make coconut milk at home from scratch.I have explained the way to make it here in detail but we do not always have the luxury of time and the special equipment needed to break and scrape a coconut.That’s the reason I end up using store bought canned coconut milk instead of making my own. I prefer ordering already deveined,cleaned large prawns from one of the online services- Fresh to Home and Licious are my choice of online Seafood and meat delivery services. Every week I order a batch of chicken and seafood from them, which I divide and freeze and take it out as and when I have to need them. When cooking prawns , whether it is fresh or frozen, you have to be careful.Make sure that the prawn is deveined otherwise you will end up with the most awful stomach ache and a 2 day free stay in your toilet! How to make the best Kerala Prawn Curry! Frankly,you don’t need to be a fancy cook..It’s that easy. But a few things to keep in mind are- Make sure prawn is fresh.Fresh prawn will obviously yield a better curry. One other thing.Dont cook the curry too much after the first boil because neither your prawn nor your coconut milk will appreciate it. Add the mustard seeds and cumin.When they start to splutter add the curry leaves.chilli and garlic.Saute for 10-15 seconds. Add the onion and sauté till they are light brown or golden.This should take 1-2 minutes. Add the cleaned prawn,Coconut milk and kokum or tamarind or lemon juice.Add ¼ cup of water. Season with salt and pepper.Add turmeric. Bring it to boil and cook till the prawns turn orange. Update:I have reduced the black pepper and started adding Kashmiri mirch for the lovely golden hue. I have also added 2 shallots which intensify the onion flavour,making this curry immensely better than before. Here are some more Curries from the West Coast of India which you will enjoy!